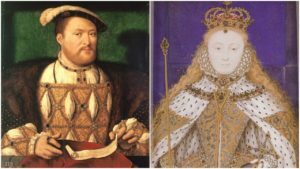 15th January has two very important “on this day in Tudor history” events. On 15th January 1535, King Henry VIII proclaimed that he was now Supreme Head of the Church of England. This followed the passing of the Act of Supremacy in November 1534. Click here to read more about this. Twenty-four years later, on 15th January 1559, Henry’s second daughter, Elizabeth, was crowned Queen Elizabeth I at Westminster Abbey. What a shock it must have been for the ordinary person to find out that everything you grew up believing has been turned upside down. I marvel at Henry, who could change his beliefs on a whim expecting everyone else to do the same whenever he did. To not do so was treason as it seems most things at this time, according to the King were treason. This would have been a frightening and confusing time to live in England. Ah yes Michael, especially for us today, watching our 21st century island home being torn apart by Brexit! Last night, on a dog -walk, I chatted to a well-informed, educated man, a ‘leaver’, who felt there was now no option left but Violence! Dear me! But if we are living through ‘interesting times’, what of our less educated ancestors, good people and catholics all, who’d be caught up in Henry’s proclamation, and have to take it on board, and work out how it would affect them personally, and their beloved country generally. My heart goes out to them, because I’m struggling frankly. And you? Hi Globerose, nice to hear from you. It’s been a while since you’ve posted. Forgive me if I misinterpreted your question. If you are referring to Brexit I am an American living in the US and though I am aware of it I do not completely understand the ramifications of leaving the EU or staying. I know there is much passion on both sides. If you’re asking me in general I am struggling as muchbad everyone else with work and bills and daily life. Wow! The only solution being violence?? That’s crazy. Yes, interesting times and it does give you insight into how the common people may have felt in Tudor times. Tsk tsk to me for making an assumption Michael: I do beg your pardon. Well Claire, I honestly did not know, in spite of my increasing grey hairs, how to respond to my earnest , middle-aged, “educated” companion, who (out of the blue) espoused violence in response to the Brexit negotiations. I remember that the late Art Critic, Robert Hughes, gave us the handy concept of, “the shock of the new”. And I try and picture people of Henry’s time, who for some of us are ancestors, trying to take on board what was being said to them. And then, when they do actually “get” the meaning of the new Henrician legislation, how do they come to terms with it? I can imagine some very angry people. Some others in complete denial. A few, and only a few, receptive. But everybody would have had an opinion. And because of the shock, things were bound to get heated .. thereafter. Firstly, thanks Claire for another good video on the colourful coronation of Elizabeth I and time taken in all of these daily videos. I have a solution, put the entire collection of MPs in a room with the heating turned up to 90 degrees, let the water run out, give them limited food, close the windows and leave them without any air for 5 days. Tell them all food and drink and air will be on when they come to an agreement. Believe me they will come to one. Regardless of how we voted our daft political leaders have the obligation to do this and to sort out their mess. They were given a mandate to leave and now can’t even agree on how to leave a room let alone leave the European Union. They should be thoroughly ashamed of themselves, every single one of them, Labour, Conservative and Liberal and everyone else and need their heads knocking together. The PM is as stubborn as a mule, Coburn is as well, the entire pack have no clue and now they want to talk to each other. They needed to do that 18 months ago. Well now they have no choice. Hopefully they will sort themselves and this out. Once we have an agreement, then resign, all of you, don’t stand again and let’s have a fresh Parliament with a complete new set of people who might look up the terms “representatives of the people” and ” public servants ” and “working together in the national interest” before standing for election. Sorry, I know that is nothing to do with the post but as someone mentioned it, I might as well comment on the elephant in the room. The Headship of the Church changed the dynamic of power in England. It gave Henry his power to move forward with the annulment and it had a lot to do with his later treatment of Anne Boleyn and others. Henry and his relationship with Parliament changed as well. The Reformation Parliament was more compliant with the Tudor legislation driving through it. Henry was able to push through his legislative programmes with new powers and Parliament which had since the fifteenth century had more confidence in its legitimate rights but which it now hesitated to exercise. Contrary to common belief Medieval Parliaments didn’t just blindly pass legislation and did speak out and refuse Kings. They had the power to refuse taxation and used such powers to air grievances. The power of Kings over Parliament would rise to its temporary height under Henry Viii and then slowly recede again by the reign of James I until Parliament finally broke that power with its rebellion during the English Civil Wars against Charles I whom it saw as an uncompromising tyrant. Charles I of course ruled for 11 years without a Parliament and Charles ii did for a number of years to the end of his reign. Henry Viii cleverly used his Parliaments to implement his new laws and to give the impression that everything he did was supported by them. His Supremacy gave him more power than any other King and he wasn’t afraid to use it.